A comedy about growing up ... and the bumps along the way. Juno MacGuff (Ellen Page) is a cool, confident teenager who takes a nine-month detour into adulthood when she's faced with an unplanned pregnancy - and sets out to find the perfect parents for her baby. With the help of her charmingly unassuming boyfriend (Michael Cera), supportive dad (J.K. Simmons), and no-nonsense stepmom (Allison Janney), Juno sets her sights on an affluent couple (Jennifer Garner and Jason Bateman) longing to adopt their first child. $413.869 thousand on 7 screens. In the winter of 2007, Juno emerged as possibly the year’s biggest critical and commercial surprise. The comedy raked in $143 million at the box office – an astonishing figure for this sort of film - while it also took home four Oscar nominations, including one for Best Picture. Does Juno deserve so much attention? Maybe not, since I don’t view it as a great flick. However, it achieves most of its goals and provides a consistently entertaining experience. 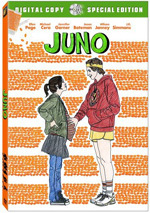 Juno focuses on quirky high school junior Juno MacGuff (Ellen Page). When she fools around with pal – and maybe hoped-for boyfriend – Paulie Bleeker (Michael Cera) – Juno becomes pregnant. This inspires horror in dad Mac (JK Simmons), stepmom Bren (Allison Janney), and best friend Leah (Olivia Thirlby), but Juno decides to have the baby. Not that she intends to keep the child, though. Juno decides to give up her offspring for adoption, so she scouts out an appropriate family. When she finds Mark (Jason Bateman) and Vanessa Loring (Jennifer Garner), she seems to locate the ideal home. Alas, all is not perfect in their world, and complications arise. The flick follows various relationships and how they impact Juno’s future as well as that of her baby. When I went into Juno, I expected the worst. I can’t stand the kind of self-consciously quirky indie flick it seemed to represent, and the first few minutes didn’t inspire any confidence in me. The film packs in artificially clever dialogue and offbeat characters in a manner that seems destined to annoy ala the ever-irritating Napoleon Dynamite. To my astonishment, Juno quickly finds its way and becomes something quite likable. This flick truly is one where the whole is much greater than the sum of its parts. Taken in isolation, I can find all sorts of problems with the film. In addition to the characters and dialogue, the whole thing comes with that “let’s do things different just to be nutty!” tone so typical of indie movies. Sometimes it suffers from Tries Too Hard Syndrome, especially in terms of the dialogue, which shows too much self-conscious cleverness and not enough reality. People wish they spoke that way, but no one does. But damn if the movie doesn’t work anyway. A lot of the credit goes to the actors. Page got an Oscar nomination that I’m not 100 percent sure she deserved, but I won’t strongly argue against the honor. She throws out Juno’s sarcastic dialogue with snap and also manages to give the character a lot of depth. Juno could easily become a one-trick pony, but she turns into something more real as the flick progresses. While I like the other performances, I will admit most remain fairly one-dimensional. They’re good but not particularly deep. The main exception comes from Garner’s excellent work as Vanessa. She’s one of the few characters in Juno who truly feels like she exists in the real world. All of the others often come across as writer’s constructs, but Vanessa has an actual pulse. I suspect much of the credit for that believability comes from Garner herself and not the script. Vanessa easily could’ve turned into a cheap Martha Stewart stereotype, but Garner turns her into something more warm and likable. Vanessa is essentially the “evil stepmother” personality in some ways, but not as played here. Instead, she becomes vulnerable and heart breaking. Garner provides an excellent performance; it’s a shame the Academy failed to give her an Oscar nomination. Even the dialogue becomes a strength after a while. Once we get used to the artificial nature of the lines, they become less off-putting. It helps that screenwriter Diablo Cody tones down the one-liners and goofy references as the flick progresses, so after a while, they don’t stand out to such a degree. The dialogue fits the flick better as the movie goes along and turns in a good side of the film. I don’t want to totally slam the dialogue, by the way. Yeah, it distracts on occasion, especially early, but the film’s comedic side gives it bite. Without the humor, Juno would’ve turned into some Lifetime melodrama, and without the serious side, it would’ve been a piece of hipster crap like Napoleon Dynamite. The two components balance each other to elevate the whole into something special. Only one aspect of the movie really leaves me cold: the music. I hate that self-consciously off-key sound with its lyrics that display a Kindergarten notion of profundity. The songs try so hard to be clever and witty but they fall radically short of their goals. They annoy from start to finish and really irritate me. Despite those constantly grating Kimya Dawson tunes, I really like Juno. It succeeds well beyond my expectations and turns into something much better than the usual piece of indie wackiness. This is a sweet, memorable little flick. Juno appears in an aspect ratio of approximately 1.85:1 on this single-sided, double-layered DVD; the image has been enhanced for 16X9 televisions. The transfer proved to be acceptable but unexceptional. Some issues with definition emerged. I noticed light edge enhancement throughout the flick, and wider shots tended to lack much crispness. Overall the impression remained fairly sharp, but delineation was never great. No signs of jagged edges or shimmering occurred, though, and I witnessed no source defects. Colors depended on settings to a degree. When we spent time in Vanessa’s world, the hues tended to go cold and clinical. The rest of the movie – most of which lived in Juno’s environment – went for a much warmer, earthier vibe with strong browns and oranges. At times I thought the colors might’ve been a little too heavy, but I felt they matched the visual design, so they were fine. Blacks seemed acceptably dense, while shadows were okay. Some interiors appeared a little too thick, but they remained generally fine. All in all, this was a watchable presentation without many real strengths. I didn’t expect a lot from the Dolby Digital 5.1 soundtrack of Juno, and the result was as low-key as I anticipated. Music played the most active role, and the songs showed good stereo presence. Otherwise the mix lacked much to make it memorable. At almost all times, the soundfield stayed with minor ambience. The only sequence that used the surrounds in a noticeable way occurred when Juno became hypersensitive to fingernails at the clinic; the scratching and tapping emerged from all around us. Otherwise, this was a subdued track. I thought audio quality seemed good. Speech came across as concise and natural, and effects followed suit. Since they didn’t have much to do, they never taxed my system, but they showed good accuracy and clarity. The reproduction of the music was also positive. Some variation occurred since the tunes came from a variety of sources, but I felt the songs seemed full and rich. This mix was perfectly acceptable for this kind of flick. Quite a few extras round out this set. We open with an audio commentary from director Jason Reitman and writer Diablo Cody. Both sit together for this running, screen-specific chat. They discuss the opening credits, cast and working with the actors, costumes, visual design and set elements, storyboards and shooting style, camerawork and cinematography, cut scenes, sets and shooting in Vancouver, and a few other production bits. 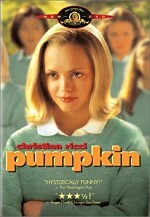 Reitman carries most of the commentary, as Cody doesn’t have a lot to say. She throws in a few notes and some funny remarks, but Reitman does the heavy lifting. He helps make this a reasonably informative discussion, though it seems a bit superficial to me. The track mostly deals with nuts and bolts of the filmmaking process and doesn’t dig much deeper. Still, it moves quickly and offers a generally good take on the flick. 11 Deleted Scenes fill a total of 20 minutes, 20 seconds. These include “Mrs. Rancik” (2:12), “Juno Hitchhikes” (0:53), “Intro to Family” (1:06), “Carry Chair to Bleeks, Sit in Car Drinking” (1:50), “Café Triste” (2:14), “Bleeker’s Bedroom with Juno” (4:59), “Lorings in Bathroom” (1:08), “Mark Plays Guitar” (0:53), “Juno Plays Guitar” (1:40), “Montage” (3:16) and “Mark’s Loft” (0:45). “Rancik” reveals a cranky, bigoted neighbor; she’s too offensive to be funny, and the scene becomes extraneous. Many of the others offer moderate expansions of existing sequences. They give us some interesting material but not much that stands out as too memorable. We see a little more of the Juno/Paulie relationship, and the most interesting bit shows Juno’s solo musical performance at a small club. The collection is good to see but nothing scintillating or vital. We can view all of these clips with or without commentary from Reitman and Cody. They tell us a little about the scenes and how they would’ve fit into the flick. They also let us know why the sequences failed to make the final cut. We learn some good info about the scenes. Two related components come next. We get a Gag Reel (5:11) and a Gag Take (1:57). The former shows a lot of the standard goofs and giggles, but some funny moments emerge as well, mostly thanks to Jason Bateman. As for the “Take”, it consists of phony antagonism between Reitman and actor Rainn Wilson. It’s not as amusing as it wants to be, largely because it seems so fake. For the three-minute and 12-second Cast and Crew Jam various folks pose and rock out in front of a shiny curtain. It’s unusual but not especially interesting; it kind of feels like something that’d appear during the end credits of some teen comedy. After this we find some Screen Tests. The 22-minute and 33-second reel shows footage for Ellen Page, Michael Cera, Olivia Thirlby, JK Simmons, and unnamed others who I assume are crewmembers used as stand-ins. Page is the focus of the collection, and it’s a lot of fun to check out this early material. Next we get four featurettes. Way Beyond ‘Our’ Maturity Level: Juno – Leah – Bleeker lasts eight minutes, 58 seconds as it mixes movie clips, shots from the production, and interviews with Cody, Thirlby, Page, Cera, and Reitman. The show looks at the three lead teen characters and aspects of their personalities as well as the actors and the performances. Some decent notes arrive here, but too much of the program devotes itself to praise for the young actors. There’s enough decent insight to make it worth a look, though. We focus on the writer with the eight-minute and 36-second Diablo Cody Is Totally Boss. It provides notes from Cody, Reitman, Page, Cera, Simmons, actors Jennifer Garner and Allison Janney, executive producer Daniel Dubiecki and producer Mason Novick. “Boss” tells us a little about how Cody got into writing and became a screenwriter as well as thoughts about the script. The early moments are the best, as once we learn about Cody’s background, it devolves into happy talk about the writer’s greatness. The director comes to the forefront in Jason Reitman For Shizz. During this eight-minute and eight-second show, we hear from Reitman, Novick, Dubiecki, Cody, Cera, Thirlby, Page, producers Lianne Halfon and Russell Smith, and executive producer Nathan Kahane. We hear how Reitman came onto the project as well as his approach to it. Yes, we find the usual praise, but we also find some nice thoughts about Reitman’s work as director. This ends up as a reasonably interesting piece. Finally, the 13-minute and one-second Honest to Blog! : Creating Juno involves Reitman, Cody, Page, Cera, Janney, Simmons, Bateman, and Garner. It offers a few details about the script and the flick. Promotional in nature, it throws out a lot of praise, but it’s enjoyable enough for what it is. The conversation between Reitman and Cody provides the best elements, as they dig into some introspective elements. Some promotional materials finish the set. We get Trailers for the Juno soundtrack as well as Charlie Bartlett, Lars and the Real Girl and Bonneville. An Inside Look advertises What Happens In Vegas. A few ads open the DVD. We get clips for 27 Dresses, The Savages and “digital copies” for portable viewing devices. No trailer for Juno the movie appears here. Want to watch Juno on the go? Then you’ll be happy to find a Digital Copy on DVD Two. This lets you transfer the flick to your computer, iPhone, iPod or other modern gizmo the youngsters love. Nothing else appears on DVD Two; it’s devoted solely to this digital copy. Maybe the biggest surprise hit of 2007, Juno overcomes many obstacles. While it could – and probably should – have been a self-consciously quirky piece of nonsense, it turns into a warm, witty and likable experience. The DVD presents acceptable picture and audio along with a mix of generally interesting supplements. Juno stands out as a fine flick, if not an exceptional DVD, so it earns my recommendation.